however, they also are suitable for operation at frequencies below 60 Hz. There is no physical limit to the underfrequency operation of the capacitors. The limit is economic, in that the capacitor kvar output is directly proportional to frequency and applied voltage. If a capacitor is operated at a frequency lower than rated, its kvar rating is reduced. Since capacitors are installed in theory to use their rated capacity, utilization at reduced frequencies is not economical, as the design rating of the unit can never be achieved. Figure 4-27. - Cluster-mounted bank of 4 three-phase capacitors. and off as needed. 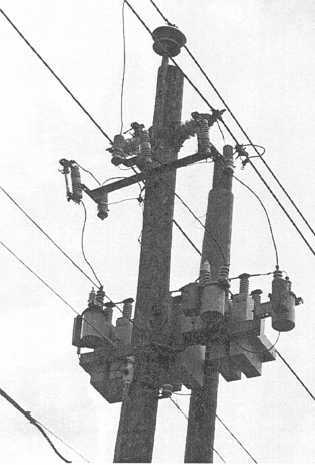 An underground capacitor bank may be equipped with oil switches for energizing three to six capacitors. The capacitor equipment may be installed in a 36-inch diameter vault. FIXED CAPACITORS. - Fixed capacitor installations are those that are continuously on the line. Fixed capacitor banks are connected to the system through a disconnecting device that is capable of interrupting the capacitor current, allowing removal of the capacitors for maintenance purposes. Fixed capacitor banks should be applied to give a voltage boost to the system during heavy load periods. Caution must be used, however, to ensure the boost will not be excessive during light-load conditions. To isolate or de-energize a fixed capacitor installation, you should open the disconnecting switches with rapid positive action. The successful switching of capacitors depends, to a considerable extent, on the technique of the operator and the speed of opening. It is more difficult to de-energize a capacitor bank than it is to energize it, because the ease with which capacitor current is interrupted depends on the point on the voltage wave when the switch contacts separate. If the arc is reestablished and maintained with the disconnecting device open, the switch should be reclosed at once to avoid damage to the switch. Another attempt should then be made to open the disconnecting device. After the disconnecting device has been opened, the capacitor installation is isolated but still charged. The capacitors should be left open from the line for at least 5 minutes before they are returned to service. This precaution will prevent a buildup of the line voltage above normal, which may occur if a fully charged capacitor bank is closed on a line. CAPACITOR CONNECTIONS. - A typical three-phase capacitor bank oil switch can be a three- pole device or three single-pole devices that can be controlled automatically to switch the bank in or out of service to control the power factor or to regulate system voltage. Fuses provide short-circuit protection. If automatic switching is not required, the fuses can be used as load-break switches by using a portable load- break tool.